Via the new Fantasy and Science Fiction blog comes a link to the visual history of their magazine. It's amazing how well the art of F&SF holds up even after almost 60 years. 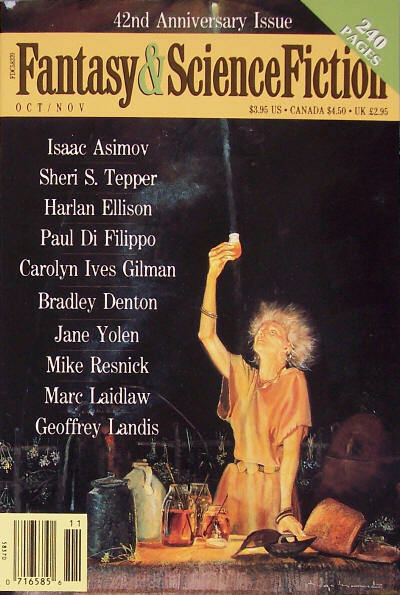 While the artwork of other contemporary SF/F magazines also had their high points, the covers of F&SF show an unparalleled artistic flair which, of course, matched the course set by this ground-breaking magazine. Of particular interest are the surrealistic paintings by George Salter which ran in magazine's the early years, and the many experimental covers of the 1960s and 70s. I particularly love Hannes Bok's 1963 cover for Roger Zelazny's "A Rose for Ecclesiastes." Unfortunately, the visual history doesn't give Bok's complete wraparound artwork, but Wikipedia has it on their site . One of my favorite more recent covers is the 42nd anniversary issue from 1991, which has a true Andrew Wyeth feel to it.